The Inventory preferences screen allows you to specify how you want inventory adjustments handled within All Orders. Allow negative inventory quantity. Allows an Item's inventory quantity to fall into negative values. Warn when negative (Ship Doc only). You'll be given a small warning when an Item's inventory quantity is dipping into negative values. Obviously, Allow negative inventory quantity must first be checked. Kit Selection prices must be the same its item's price. When you add a kit selection to any kit component in the Item editor, it assumes the selected Item's price by default. Normally, this price field remains editable; check this field to disallow edits. 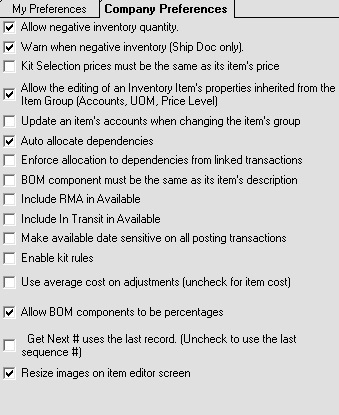 Allow the editing of an Inventory Item's properties inherited from the Item Group (Accounts, UOM, Price Level). If unchecked, an Inventory Item's properties will always be the same as its Item Group, with no option of editing the properties on a per-Item basis. Update an item's accounts when changing the item's group. While it's rare that you would want to change a particular Item's account, you may at one point wish to change its group. If checked, the account will change to the new group's default account when moving an Item from one group to another. Auto allocate dependencies. If checked, transactions that are linked will automatically fill those transactions waiting for available inventory quantities. For example, say you create a Sales Order, but can't fill it due to a lack of inventory in stock. If you batch a Purchase Order from which you receive the available quantities, then the SO will be filled, and a Ship Doc automatically created. Enforce allocation to dependencies from linked transactions. Unchecking this option will allow a transaction needing a certain amount of inventory quantity to allocate any in-stock quantities, even if they're reserved for another transaction. For example, say you just received ten widgets on a Receiving Doc that had a dependant Sales Order. Under normal circumstances, that those widgets are reserved, and cannot be touched by other transactions. Force allocation frees up even reserved inventory, allowing you to "borrow" those widgets for other transactions. BOM component must be the same as its item's description. Under normal circumstances, users can manually edit the description for a bill of materials. If checked, the description will be rendered uneditable, automatically taking on the description of the component Item. This way, if the Item's description ever changes, the BOM component description changes automatically as well. description ever changes, the BOM component description changes automatically as well. Include RMA in available. Check if you want to include pending customer returns as inventory available to sell. Include In Transit in available. Check if you want to include inventory receipts that are in transit as inventory available to sell. Make available date sensitive... Generally available quantities use the current date and not the transaction date (with the exception of the count, adjustment and value adjustment). Check this option to use the transaction date instead of the current date. Enable Kit Rules. Check to use kit rules. Use average cost on adjustment:By default the system assigns standard costs to items when they adjusted into or out of inventory. Check this option to use the current average cost instead. Allow BOM components to be percentages: see Using percentages in BOMs. Get next # uses last record: By default when using Get Next # to generate items #s, the system will look for the most recently entered #and then generate the next one in sequence. By checking this option, the system will instead look for the last record in the list after sorting it alphanumerically and then use that one to generate the next on in sequence, regardless of when the item was entered. Resize images on the item editor screen: When this preference is checked, all orders will automatically resize your image to fit the screen.